Hi everyone, it’s Carrie here – I hope that we are all good and enjoying playing with our wonderful ‘Do What You Love’ kits. I adore this kit and am so pleased that I get to use it to create my first design team project. To kick of my term on the Lollipop Box club Design Team I thought that I would start with what I love, which is playing with mixed media. Some people think that mixed media is hard, which I can understand. The real trick with mixed media is to relax and just play with it. I find that the less that you try and plan it, the better that it turns out. I started this page by adding some torn up book pages and the washi tapes (add ons from the shop) to a piece of light blue cardstock. I did this using matte medium but you could use any glue you have. I added the strips to the middle of the page and also to the top right hand side of the page and the bottom left, adding them horizontally and vertically to create interesting shapes. Next I used the clouds stencil (add on from the shop) and some clear embossing powder to add some texture to the background. Once this was dry I coated the whole page in white gesso, wiping the gesso off the clouds with a wet wipe before it dried. The rainbow stamp that came in the kit is super cute – so I added this. 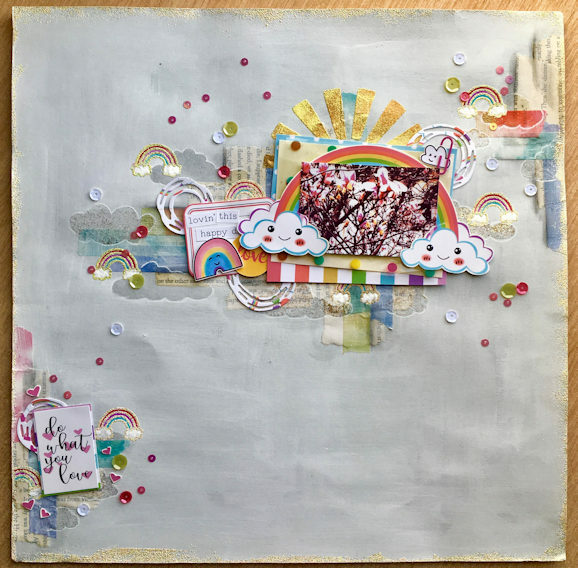 To continue the rainbow theme I mixed pink, blue and yellow embossing powders together and used this to emboss the rainbows. To make them pop I painted in the stripes and clouds. I also embossed a beautiful sun to the page, which was a stencil from a previous kit. I love layering on my pages, I always add lots of different layers behind my pictures. I like just little bits peeping out, so that you can see a bit of each paper. 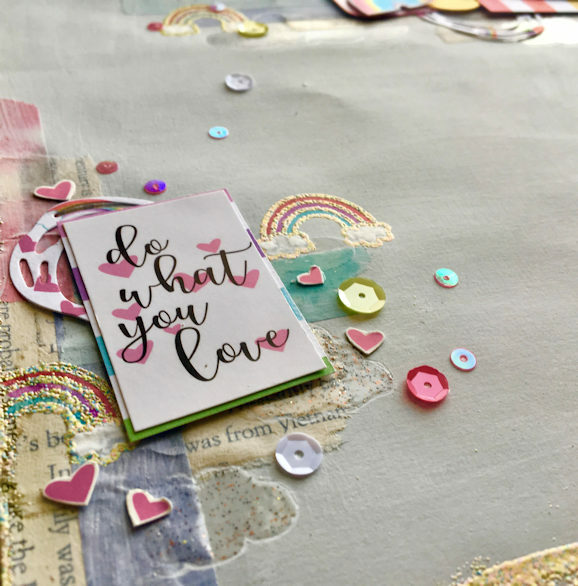 For this page I used a spotty plastic layer that came in a previous kit, along with the gorgeous rainbow striped paper and the blue polka dot paper. 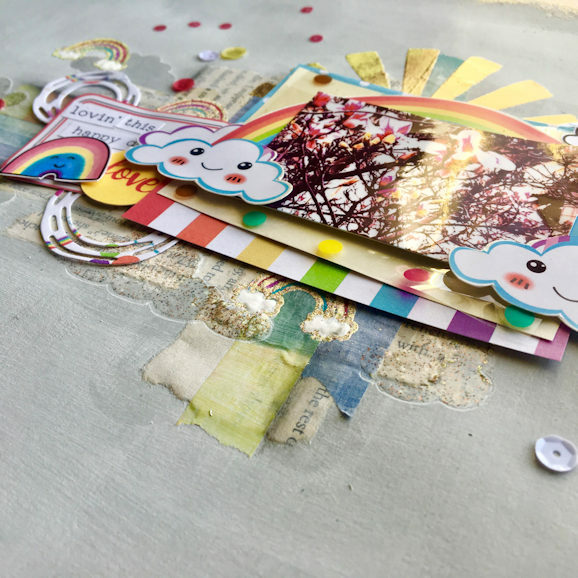 This months postcard had those gorgeous happy faced clouds and rainbow on. I fussy cut this as well and used it to frame my picture. 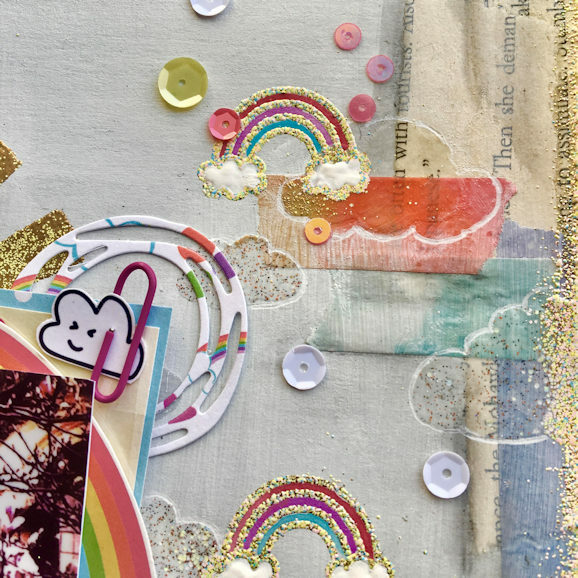 Other embellishments come from the cut apart sheet, the die cut pack and I also used a scribble circle die to cut some shapes from the rainbow icon paper. 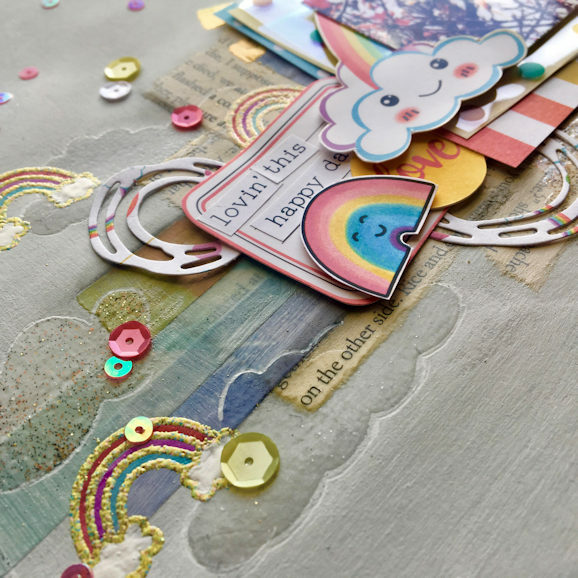 To finish off the page I embossed the edges with the left over rainbow powder that I mixed up and added some sequins. This page was so much fun to make. The kit is so bright and sunny. It really makes me think of spring. I am so happy to be on the design team – I really hope that you have enjoyed looking at my page as much as I enjoyed making it.